2009 was an exciting year for us in the North. Our existing Units located at Aklavik, Inuvik, Cambridge Bay, Yellowknife, Hay River and Fort Chipewyan all recorded extensive searches over the summer involving the use of Aircraft, Coast Guard ships and RCMP resources. Two of our New Units located at Fort McMurray and Rankin Inlet were quite quickly indoctrinated with searches lasting several days immediately upon becoming operational. In fact Fort McMurray had just completed a SAR course and the next day tragedy struck when two canoeists went missing. Unfortunately both drowned. Another incident whereby PFD´s would of made a difference. Rankin Inlet became involved in a rescue of a family stranded on an island off the coast due to weather. Their response was excellent and was the first time a CCGA Unit was tasked on Hudson Bay. Cambridge Bay was involved in the rescue of the sailing vessel “Perithea”, a German flagged sailboat that had its sails blown out in gale force winds and had to be towed to Cambridge Bay for repairs before proceeding through the Passage. In mid November our newest Unit was formally established in Pangnirtung, Nunavut. We are very fortunate that the Unit Leader, Peter Kilabuk and his crew are all SVOP / MED A3 certified with one holding a Masters Limited certification. We look forward to their participation next season. They will be receiving training over the winter as Mark GAGNON and I will be visiting “Pang” in March. Other significant events involved participation in a Sovereignty exercise in the Beaufort Sea by our Members crewing on RCMP vessels which are CCGA Registered SAR assets. This provided an excellent opportunity for inter-agency training as well as ocean navigation and survival skills. Weather precluded some air support from 440 Squadron however; we did have access to an Aurora who conducted aerial patrols in the vicinity of Herschel Island. With the number of adventurers increasing our SAR role is contingent upon being familiar with and able to operate in the Beaufort Sea. This took place in August and involved Members from Hay River, Inuvik and Aklavik Units in conjunction with Joint Task Force North (DND), Canadian Coast Guard, DFO and “G” Div RCMP. A total of 2800 nautical miles was covered during the exercise. Last year the Arctic District obtained a grant from the International Polar Year organization which allowed us to purchase equipment not provided in the Contribution agreement to further the CCGA´s capabilities north of 60. With the purchase of Iridium Sat phones, Image stabilizing binoculars, inflatable PFD´s, Lap tops, Floater Suits and a Thermal Imaging unit we have been able to supply all out Units with much needed equipment that otherwise they would not be able to afford. This year´s focus on Great Slave Lake with our Hay River and Yellowknife Units was navigation, communication training and in particular familiarization for new Members. The expanse of Great Slave Lake and in particular the lack of logistical support i.e. gas, communication etc requires that our Members are abundantly familiar with what is necessary before they depart home base. Mark and Kathleen ran a very successful RHIOT course in Hay River and indeed the weather cooperated and was terrible, just what is required. Members from Hay River and Yellowknife attended this course as we are the two units with RHIBS. Our President got a firsthand look at what it costs to do business up here when he visited the District in June. We took Gary across the Lake in the “MacKenzie” where he met with the Yellowknife Unit. I appreciate he took the time to actually come up and see what the North is all about. Juanita again travelled north to Yellowknife to conduct SMS training. Due to some airline “scheduling” issues she was fortunate enough to be able to attend the “Folk on the Rocks” music festival in Yellowknife. She will be back to Hay River before April to put on more hands on training. With our Units all having lap tops this will be much easier to facilitate. 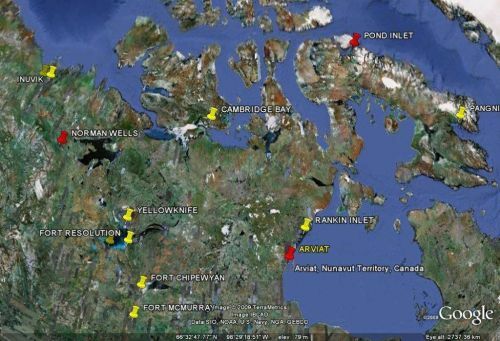 As you can see from the Unit Map above there are two red pins located at Norman Wells NWT and Pond Inlet Nunavut. We are in the process of expanding to these two locations and hopefully will be up and running for the next navigation season. Pond Inlet is important as it is located at the beginning/end of the Northwest Passage. This has been a very successful year and with new Units in place and existing Units in good shape we look forward to getting some “indoor” training done during the dark season.